I mentioned earlier in my post about the Orix Anniversary set that Leon Lee was the first black manager in Japan when he managed the Blue Wave back in 2003. 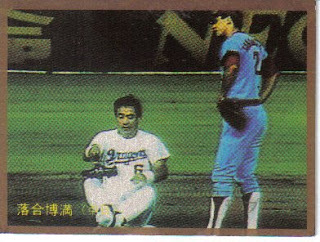 Lee was the hitting coach for the team and took over after Hiromichi Ishige (the former Seibu Lions infielder) was fired 20 games into the season with a record of 7-12-1. The Blue Wave went 41-76-3 in the 120 games that Lee managed. Following the season, when the Lions let Haruki Ihara go (because somehow finishing first and second in his two years of managing wasn't good enough), Orix hired him to manage and asked Lee to take his old job as hitting coach again. Instead, he returned to the States. I got much of the background information for above from the entries for Lee, Ishige and Ihara from Japan Baseball Daily's manager section. Hitting the stores this past fall was a set produced by Epoch (who's previous contribution to Japanese baseball cards was a set of stickers back in 2000) that commemorates the 15th Anniversary of something called the "All Japan Baseball Foundation". I'm not exactly sure what this organization is, but I think they're a group of retired players that promotes youth baseball. Their website is here and there's a page with information about the set (and possibly order it, although I don't know if they ship internationally) here. The set is a 77 card box set that includes 76 "regular" cards of OB players and an autographed card. The set information page I referenced above gives a complete list of the players in the set - this Google translation of the set information page does a decent job of rendering most of the names in English - players marked with an '*' have autograph cards available as inserts. It's an eclectic group of players ranging from players from the 1940's (Tetsharu Kawakami) to almost the current day (Shinji Sasaoka). Sadaharu Oh, Isao Harimoto, Koji Yamamoto, Tsutomu Wakamatsu, Senichi Hoshino and Koichi Tabuchi are some of the big names in the set. Since I don't know why these players were selected, it's difficult to say who a notable exclusion is - the set doesn't have Shigeo Nagashima, Katsuya Nomura or Masaichi Kaneda in it, but I don't know if that's because they're not involved with the organization. A couple of players in the set are deceased - Kazuhisa Inao and Akira Ohgi. Choji Murata shows up in the set after being noticeably absent from recent BBM OB sets. That's Yoshinori Hirose (#46), Morimichi Takagi (#14), Yoshio Yoshida (#09), and Yukihiro Nishizaki (#60). I'm not sure really what I think of the set. It's an interesting collection of players, but if you're looking for something to be a good representation of NPB history, this probably isn't it. 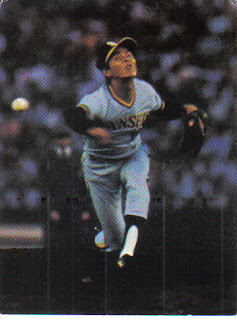 Following the 1988 season, the Hankyu Corporation sold the Braves to a company called Orix. 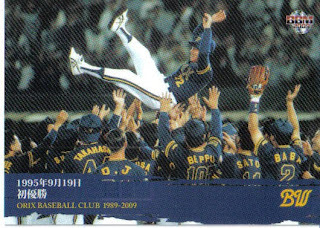 The team was called the Orix Braves for the 1989 and 1990 seasons, then renamed the Orix Blue Wave in 1991. Following the 2004 season, Orix and the Osaka Kintetsu Buffaloes officially merged, although essentially what happened is that the Buffaloes were absorbed by Orix and Kintetsu stopped owning a baseball team. The resulting team was the Orix Buffaloes. BBM has celebrated the 20th Anniversary of Orix buying the Hankyu Braves with a 55 card box set (as opposed to the usual 99 card pack-based sets for the rest of the recent Anniversary sets). Despite being smaller, the set follows the same pattern as the other Anniversary sets - there's a six card subset showing highlights in Orix History, 33 cards featuring former Orix players and 15 cards for the 2009 team. Each box set also contains an insert card which potentially could be some sort of memorabilia card. 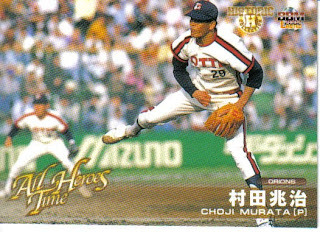 The six events chosen to represent the high points of the past 20 years were Ichiro Suzuki's 200 hits in 1994, Koji Noda's 19 strikeout game in 1995, Yoshinori Satoh's nohitter in 1995 (he was the oldest pitcher to throw a nohitter until Masahiro Yamamoto threw one in 2005), the clinching of the Pacific League pennant in 1995, the Nippon Series championship in 1996 and the retirement of Kazuhiro Kiyohara in 2008. The last one strikes me as a bit of an odd choice, seeing as how Kiyohara didn't play for Orix very long and seeing how making the Climax Series in 2008 might have been more significant. The 33 former Orix players include both retired players and those still playing elsewhere, both in NPB (Yoshitomo Tani, Arihito Muramatsu) and MLB (Ichiro, So Taguchi). 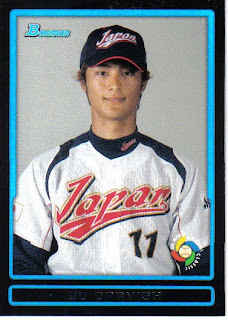 (I think this is only the second appearance of Ichiro in a BBM set since he left Japan, but I could have missed one.) 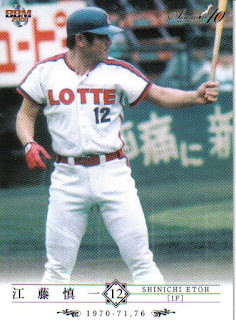 Retired players include Boomer Wells, Shigetoshi Hasegawa, and Koichi Ohshima. 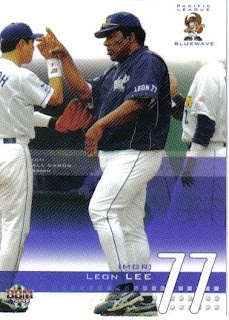 I don't see any glaring omissions, but it might have been cool to have had a card of Leon Lee, who was the first black manager in Japan when he managed the Blue Wave in 2003. 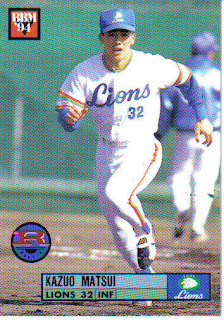 Troy Neel had some good years with Orix in the mid-90's, but was probably left out due to his current legal issues. 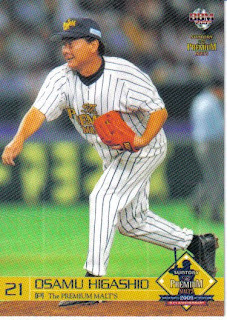 I found it a bit odd that there isn't more variation in the uniforms shown in the photographs for the former players - no one is shown in an Orix Braves uniform and only Kazuhiro Kiyohara and Akira Ohgi are shown in Buffaloes uniforms - and there was no other option for Kiyohara. 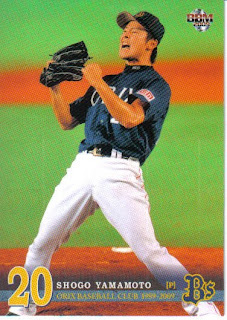 The picture they used for Ohgi was strange not simply because they must have had a million pictures of him in a Blue Wave uniform (since he managed the team from 1994 to 2001), but also that it's pretty much the same picture that was used for his 2005 BBM 1st Version card. The 15 players chosen to represent the 2009 team include Tuffy Rhodes and Alex Cabrera, although it doesn't include the manager Daijiro Ohishi. 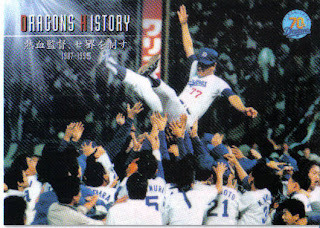 That's Ichiro Suzuki (#18), Shogo Yamamoto (#37), and the card commemorating the clinching of the Pacific League pennant (#52). In the Hall Of Fame balloting a few weeks ago, Hiromitsu Ochiai missed election by only three votes. Former Giants and Tigers pitcher and lately Fighters coach Shigeru Kobayashi passed away abruptly last weekend. 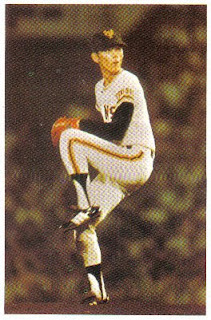 As Deanna points out here, he was a pretty good pitcher in the late 70's - early 80's who career is now mostly remembered as the guy traded to the Tigers for Suguru Egawa during the "Egawa Affair". 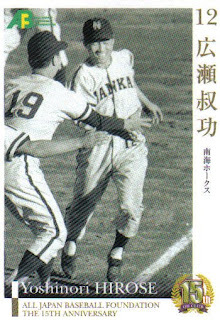 The "Egawa Affair" was when Suguru Egawa refused to sign with the teams that drafted him (first the Lions, then the Tigers) because he wanted to play for the Giants. Eventually, the Giants basically said that if he wasn't allowed to sign with them, they'd up and leave NPB. 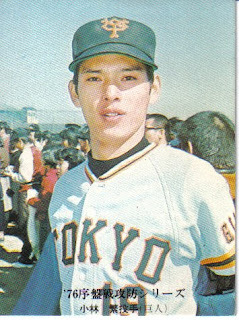 Given the popularity of the Giants compared to the rest of the league, the league caved and the Giants were allowed to trade Kobayashi to the Tigers for Egawa. I frequently use this story to show people who compare the Giants with the Yankees that the Giants have been able to pull stuff that the Yankees can only dream of. And in case anyone thinks the Giants shenanigans are only in way in the past, remember that a couple of years back, the Hawks gave the Giants Hiroki Kokubo for nothing. 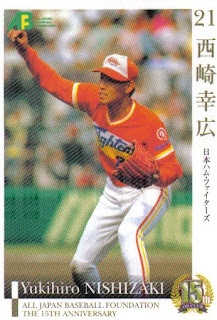 Speculation at the time was that Daiei was preparing to sell the team and wanted to ensure that they had the Giants approval for whoever they sold the team to. And shortly after, they sold the team to Softbank. That's 1975/76 Calbee #606, 1978 NST #30, 1979 Calbee "July's Best" #2 and 1979 TCMA #85. Recently, Topps put out the Bowman Draft Picks And Prospects set which included one more World Baseball Classic subset (don't think it could be considered an insert set - I bought two packs and got four WBC cards!). This set has 35 cards including six players from Japan - Norichika Aoki, Yu Darvish, Munenori Kawasaki, Daisuke Matsuzaka, Ichiro and Seiichi Uchikawa. All of the photos are "mugshots" like the one of Darvish above (#BDPW2). 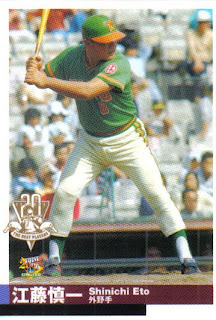 I think this is the only card of Kawasaki in all the WBC sets. I'm guessing that this is the final WBC set for the 2009 games, so I'll try to do a wrap up of all the sets in the next few weeks. When Hideki Matsui was a rookie back in 1993, there were some major expectations laid on him. 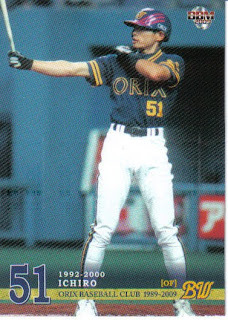 He was given uniform number 55, for the number of home runs he was expected to hit in one season which of course would tie the existing record shared by Sadaharu Oh, Tuffy Rhodes and Alex Cabrera (although it was held solely by Oh in 1993). He was also expected someday to break Oh's career home run record. 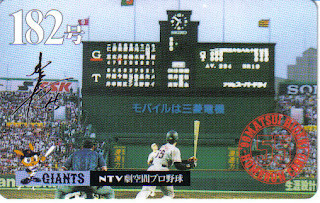 To this end, Nippon TV started a card set featuring a card for each home run Matsui hit. This set has continued to the present day, including the home runs he's hit for the Yankees. Nippon TV is now looking into whether or not they can get recognition from Guiness for longest running baseball card set. Jason had a post about this set last month and a link to a gallery of his collection of these cards. The Yakyu Baka story I linked to above has a link to the Offical Matsui Home Run Card club website. There will also be the usual 19 card Best 9 and 18 card Gold Glove insert sets, along with a 12 card (one for each team) "Lightning 2010" set. Plus the usual batch of autograph/memorabilia cards. It looks like BBM is doing something interesting with their "20th Anniverary Commemoration" cards. The subset is going to be spread throughout the 1st and 2nd Version sets as well as the Touch The Game set and the individual team sets. Each team will have 3 cards in the 1st Version, 2nd Version and Touch The Game sets plus six cards in their team set for a total of 15 cards per team. This past week the Japanese Baseball Hall Of Fame announced its latest inductees - Shinichi Etoh and Osamu Higashio were the two professional players inducted (amateur player and former college teammate of Shigeo Nagashime Masayuki Furuta was also inducted). 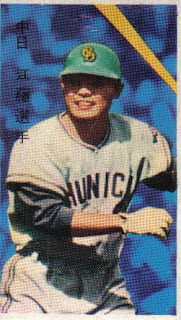 Shinichi Etoh had an 18 year career from 1959 to 1976 with the Dragons, Orions, Whales and Lions. He also managed the Lions (as player-manager in 1975, his sole year with the team). He was the first player to ever lead win the batting crown in both leagues and finished his career with 367 home runs and a .287 batting average. 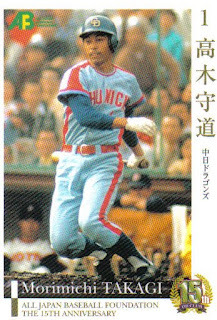 Osamu Higashio had a 20 year career from 1969 to 1988, all with the Lions (Nishitetsu, Taiheiyo Club, Crown Lighter, and Seibu). 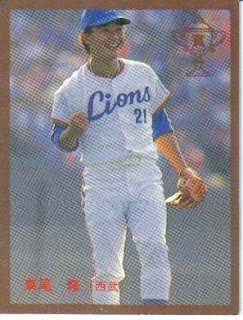 He also managed the Lions from 1995 to 2001, winning the Pacific League pennant twice. He had a career record of 251-247 and an ERA of 3.50. BBM's website this week announced the 2010 Rookie Edition set. This set features players taken in last fall's draft which despite occurring in 2009 is referred to as the 2010 NPB draft. 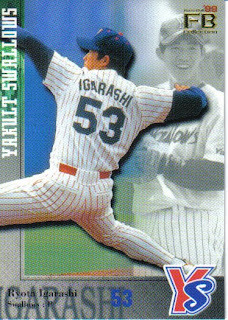 The set will contain 114 cards of which 81 are newly drafted players (including the first card of Yusei Kikuchi), 24 are cards featuring current players as they looked when they were first drafted, 5 cards for the new 2010 managers - Norifumi Nishimura (Marines), Kenjiro Nomura (Carp), Marty Brown (Eagles), Takao Obana (BayStars) and Akinobu Okada (Buffaloes) and 4 cards that I am not sure about but I think are traded players. There will also be the usual collection of insert/memorabilia cards. The set will be released in early March. Looks pretty much the same to me! Like Katsuya Nomura, Murata is curiously absent from recent OB sets. He doesn't appear in either the 2008 "Back To The 70's" or 2009 "Back To The 80's" sets or the Lotte 40th Anniversary set, although he was in the 2004 "Golden Arms" set. Before this sends anyone off on a wild spending spree, buying up rookie cards, there's some history to be examined. 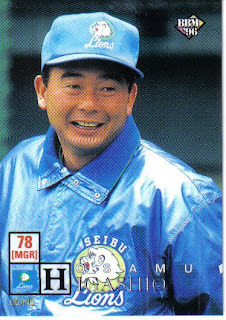 The fifth edition of Gary Engel's Japanese Baseball Card Checklist and Price Guide lists the above Kazuo Matsui 1994 BBM rookie card (#506) with a value of $70. 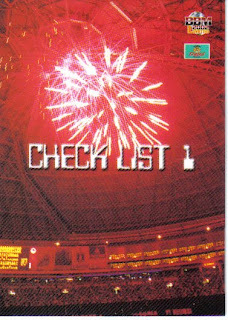 The book was published in 2002, roughly a year and a half before Little Matsui signed with the Mets. I had actually seen the card go for more than that on eBay. 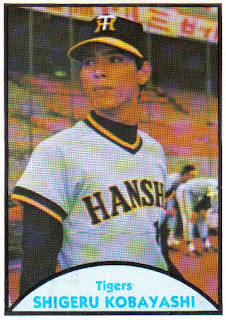 This card once ranked among the most valuable "regular" BBM cards out there, along with Ichiro and Hideki Matsui's rookie cards. The latest version of the Checklist and Price Guide (the seventh edition) lists the card at $40. I've seen it (and actually bought one) for MUCH less than that on eBay. I'm not making any statement on whether or not I think Darvish is serious about asking to be posted or whether or not he'd be successful in the majors. I'm just saying I've seen something like this before and it didn't go the way everyone expected it would. - Jason told me about a website that will do proxy bidding on Yahoo! Japan Auctions for you called kuboTEN. Here's how it works - first you register with kuboTEN. Then you browse the Yahoo! Japan auctions looking for whatever you're interested in. You can browse from kuboTEN directly (they run the pages through a translator) but you don't have to. Once you've located something, you tell kuboTEN what it is and how much you want to bid. It may take several hours for them to post your bid, so it would be difficult to bid on something at the last minute. The seller then ships your item to kuboTEN's office in Fukuoka, who will then ship the item to you. It's all very slick, but as you might expect, it doesn't come free. When you win an auction, you need to pay kuboTEN not only the cost of the item plus whatever shipping cost from the seller to their office, but also 10% of the sales price plus $10. You'll also have to pay the shipping charge from Japan for your item, but you can combine shipping on multiple items. So far, I've won a group of cards from an auction and paid kuboTEN for them, but I haven't arranged shipping for them yet. I'm going to probably end up paying around $7 a card for the five cards I'm getting - a bit steep, but I've not been able to find the cards anywhere else. I'll talk about it more when I get the cards. I know Jason's been pretty pleased with them. - One of the things I discovered while browsing Yahoo! Japan auctions is that there is a set that commemorates the 15th Anniversary of the Japan Baseball Foundation. I don't know anything about the Foundation, but the set is a boxed set containing 77 cards - 76 cards of OB players and a single memorabilia/autograph card. Not sure who's in the set off hand, although it looks like Sadaharu Oh and Hiromitsu Ochiai are on the box (and Masumi Kuwata and Choji Murata are the cards in the picture from the auction). I haven't seen anything on BBM's website for this set, so I'm assuming that it's not them (that copyright line on the box for them is probably simply for the pictures). I think that they may be done by Epoch, who did a bunch of stickers back in 2000, but I'm not sure they've done anything else since. 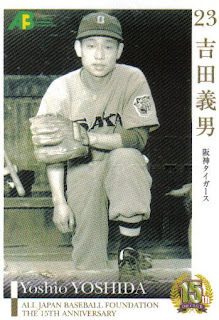 - There's a couple cool card galleries out there - Jason has posted his Hideki Matsui Home Run cards and A Noburo Aota Fan's Notes had a post a few weeks back linking to a nice collection of old bromide cards from the late 1940's. 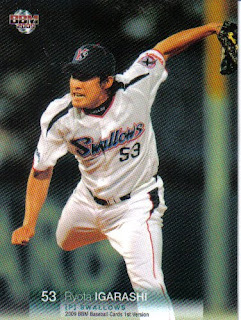 Little late as usual on this, but former Swallows pitcher Ryota Igarashi has signed a two year deal with the Mets. 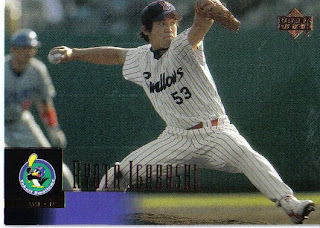 Igarashi's rookie card is #289 in the 1998 BBM set. 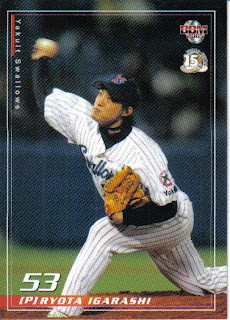 I think his first Calbee card isn't until the 2001 set (#023)2000 set (#184), but I could be wrong. He's in the BBM All Star sets from 2000 and 2002-05 and the Nippon Series set from 2001. 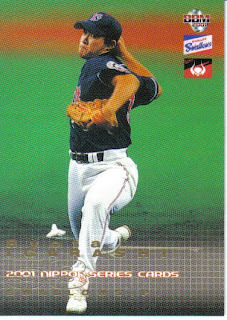 For Upper Deck, he's in the 2000 Ovation Rising Stars insert set and the 2001 Victory and Upper Deck sets. As always, this is not a comprehensive list, just a couple highlights. From top to bottom: 1999 Future Bee #017, 2001 Upper Deck #83, 2001 BBM Nippon Series #S10, 2005 BBM Swallows #S41, and 2009 BBM 1st Version #375.